This roadside rest area is just north of the village of Arcadia, high on the north end of the circle of bluffs that surround the town. The parking area is open year-round, although the latrines are locked in winter. There are great views, best to the south, but you can see north to Frankfort. The location is pretty much on the Manistee-Benzie County line, and may be technically in Benzie County. The description begins at the parking lot. From the parking area cross a brick terrace and step on to the lowest wooden platform. From there just take the steps which lead north and upward to the top of the hill. There are 120 steps, with several platforms for resting along the way. Some platforms have benches. There is no sign prohibiting dogs (on leash suggested- it's all very close to the road), but few dogs will be willing to climb the steps as they are open metal grating. Treadway- wooden decks and metal grate stairs. Ecosystem- sand bluff on the shore of Lake Michigan. One of the best high points for viewing the beach on the west side of the state. Other points of interest- The village of Arcadia is 1.5 miles to the south with small town services. Picnicking- There are four picnic tables just beyond the edge of the parking area, all in full sun. No grills. 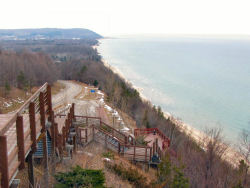 Scenic Views- observation platforms offer great view of Lake Michigan from one of the highest points along the shore which is public property. Telescopic viewer at the highest platform in summer. Handicap Accessibility- This park is quite accessible. Although you have to change surfaces (asphalt to brick to wood) there is no barrier to getting from a vehicle to the lower viewing platform. One of the picnic tables has an extended end for wheelchair seating. The latrines are barrier-free. The worst thing about the site for accessibilty is that the entire parking area is paved on a slope, so if someone were unable to control their chair there is a possibility that they would roll down toward the south end. Seasonality- parking is open all year, but latrines are locked in winter. Telescopic viewer removed in winter. Take M-22 north from Manistee or south from Frankfort. The rest area is on the west side of the road 1.5 miles north of Arcadia, and is marked with the blue roadside park signs used by the DOT.